Star Trek: Asterisk "A Private Little War"
Bones and Kirk attempt to balance the score on a planet that is being "helped" by the Klingons. Spock gets slapped by a substitute doctor. While Bones, Kirk and Spock are taking a look around on a primitive planet, they find that the natives, who are not yet old enough to have first contact, suddenly have advanced weaponry that they shouldn't have for another few decades. Of course, because of the Prime Directive, they can't make themselves known, so they're hiding around while spying on the curious goings on. Unfortunately, don't hide well enough because they eventually get caught. Some of the natives find them and start to shoot at them. Spock is shot with a primitive shot gun, so Kirk and Bones are forced to fight back with phasers, despite this breaking the Prime Directive. When the natives are out of sight, they beam back to the ship and take Spock to sick bay. While they're back on the ship, Bones starts to work on Spock's wound. Kirk is obviously very distraught by the thought of his friend being mortally wounded, but there are Klingons on the starboard bow, so he has to go to the bridge. Once there, Chekov explains that the Klingons don't know the Enterprise is there. As long as they maintain orbit, they'll remain undetected. So this brings to attention the very distinct possibility that the Klingons are aiding one of the tribes with advanced weaponry. If that's true, it'll be Kirk's responsibility to fix the cultural contamination. So he puts Dr. M'Benga (who happens to have a lot of experience with Vulcans) in charge of Spock while he and Bones goes down to the planet surface to infiltrate the friendly tribe. 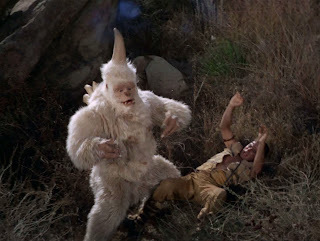 No sooner have they beamed down than Kirk is attacked by a horny white ape. The mugato's poison infects Kirk, so Bones has to carry him to the friendly tribe to treat him before he dies. They need to find the guy that Kirk met the first time he was on this planet 13 years ago, Tyree. Turns out Tyree has become somewhat of an important figure in his tribe. When they get there, Bones finds that Tyree has become the leader. So they get special treatment. When Tyree actually arrives, he comes with Nona who is some kind of medicine woman. But before Tyree enters the cave where Kirk is, Nona sneaks in and finds Bones heating up some rocks with a phaser. Well, that did it. Now Nona knows they have some kind of magical technology, so she helps Kirk, but she uses a spell that binds him to her so that he has to do whatever she says. And then the rest of the episode we're left to wonder if Kirk is making his own decisions, or those of Nona. When Kirk recovers, he meets with his friend Tyree and then makes plans to investigate the other tribe's weapons. He and Bones finds that they do, indeed, have technology way ahead of their time and that a Klingon is supplying and teaching them. Meanwhile, Dr. M'Benga has had enough of Spock's BS. 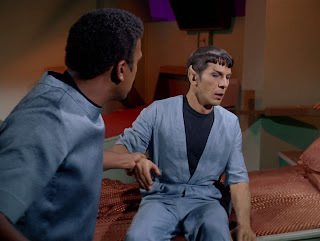 Apparently, the correct way to wake a Vulcan up from shot gun recovery is to slap him several times. So the other doctor does that to Spock and then Spock is OK to return to the bridge. Meanwhile, back on the surface, Kirk teaches Tyree and his tribe how to use flintlock weapons in order to balance the power. Bones is against the idea, though. Giving them more power is exactly what Nona wanted. And it really doesn't help that Kirk goes off and cavorts with Nona afterwords and makes out with her by a waterfall. Tyree even sees this and considers shooting Kirk, but he's disgusted by the weapon, throws it down and leaves. Just in time for another mugato to attack. Kirk is in a daze from the drug that Nona used on him, but he eventually shakes it off long enough to use his phaser on the mugato and save Nona. And Nona thanks him by hitting him over the head and taking the phaser. Nona takes the phaser to some of the enemy tribesmen and demands to be taken to their leader who will know how to use the phaser. But the tribesmen want her for themselves and attack her. Tyree, Bones and Kirk eventually arrive and find her. The tribesmen think it's a trap, and then stab Nona and leave. Nona's death infuriates Tyree. He no longer wants a peaceful solution to their problem. He asks Kirk to supply them with more weapons. 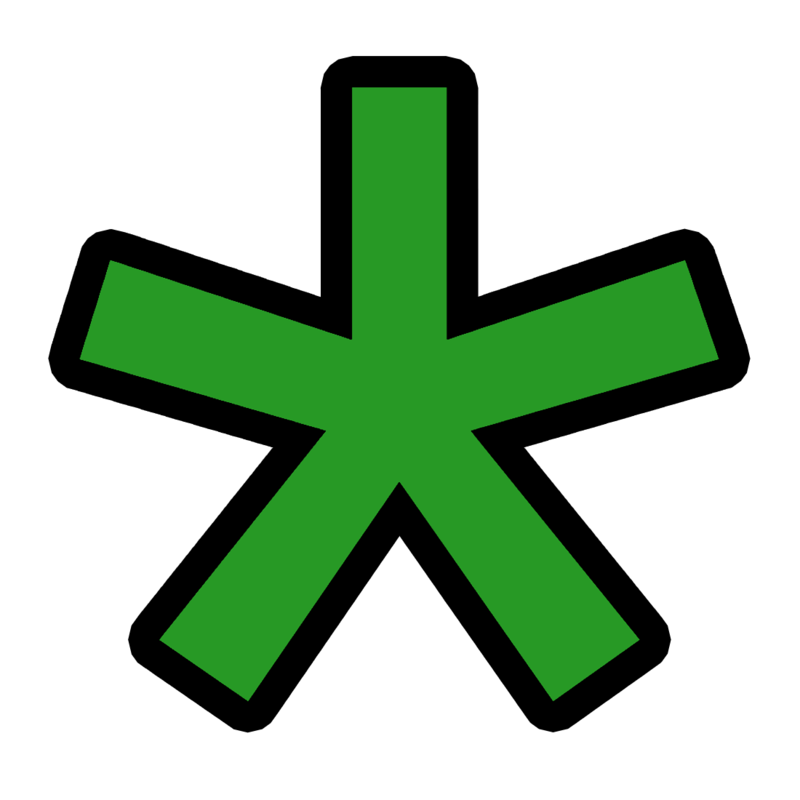 So Kirk calls up to the Enterprise and asks for 100 "serpents for the Garden of Eden." Ok, we got it, humanity isn't meant for Eden, yadda yadda yadda... What I don't get is this pro-war stuff in a Star Trek episode. Particularly an episode co-written by Gene Roddenberry. It's apparently a comment on the Vietnam war, but the clear solution to this episode's particular problem was not to arm the other side, but rather to call out the Klingons. The Original Series is famously a counter-culture, anti-war, hippy program and here Kirk is supplying the weapons. The argument could be made that Kirk is under the influence of Nona's medicine, but that's a weak argument considering 1) we don't believe in magic in Star Trek and 2) Kirk's final decision to bring down 100 flintlock weapons was made after Nona was killed. I'm not a fan of this episode. It just doesn't make sense to me.